Look for a Jack Russell terrier riding along on the back of Jane Paine's bike. Photo: Courtesy Jane Paine. Her steed of choice for commuting is a twenty year old mountain bike with a basket on the back that can fit her Jack Russell terrier, Rally, a briefcase and a roll of building drawings. “When I decided to start commuting by bicycle about ten years ago, I put a rack on the back of my old bike and wanted a nice, sturdy wire basket to mount on it. I asked my parents if they had anything like that and my dad gave me the one he used to carry me around in on his bike!” She’s carried bags of potting soil and regularly puts the weekly groceries inside it. About three times per week, Jane hits the gym on Foothill Blvd and is always amazed that more people don’t ride their bikes to the gym. “When I first started doing it, I really envisioned I could lead by example. I mean, how sensible can you be to ride to the gym, get a little warm up before you really exercise, complete your work out, shower and go to work. It just makes so much sense so why don’t more people do it?” Several years have gone by since she started working out at that gym and the only people she’s seen unlock bikes from her rack have been one elderly couple who came one time to test out the facility. Jane’s favorite commuting activity is what her husband Scott refers to as a Bike-A-Date. About once a week, both Jane and Scott will ride to work and meet at a restaurant downtown for dinner and pedal home with their lights after fueling up with delicious morsels from local favorites such as Em’s, Tin Angel or Sage’s Café. Sometimes they stop for gelato at 9th and 9th on the way home. If a Bike-A-Date starts at home, they make a margarita for their water bottle to tide them over while they pedal to a party, a restaurant or a concert. 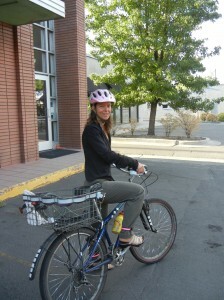 They love the bike valet at Red Butte and can put a cooler of goodies in Jane’s rear basket for their concert picnic. Next time you see a bike zooming down the road with a little dog poking his head out of a rear basket between Holladay and downtown, chances are it’s Jane. If you are lucky, it’s a Bike-A-Date night and she’s got a little extra margarita in her water bottle to share.